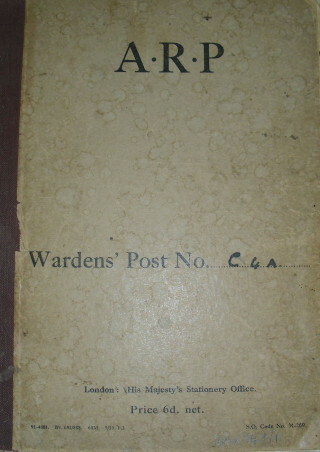 It is not possible at this juncture to be certain where Wardens’ Post No. C4A was situated – a good guess being somewhere between Gustard Wood and Harpenden -, or in what sort of accommodation it operated. One thing is certain and that is, being in a very rural situation, time must have weighed very heavily upon those on duty as evidenced by the very large gaps in between reported incidents in the log – often of several weeks at a time. Nevertheless, it is only with hindsight that we now know that such devotion to duty by ordinary citizens, grossly under-resourced, was never to be tested by invasion. The log, sparse in detail, with some information frustratingly obscured by ink blots, gives up some intriguing references. For instance the joint exercises with the Home Guard and frequent reference to finding themselves at odds with others over naked lights brings to mind ‘Dads Army’ and the cry “put that light out. As time evolves it is also interesting to note the two references to silver foil falling from the sky, which is obviously ‘window’ developed for jamming RADAR. Whether this was jettisoned British foil or a German copy, we shall probably never know. Towards the end, it is interesting also to see the appearance of “flys” and “pilot-less aircraft (V1’s) and later V2’s. Parachute seen towards Harpenden, notified police. Miss BH reported plane down behind Hall Wood in Kimpton. Sent bits of map picked up on the common to Head Warden. 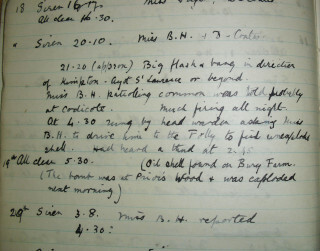 Miss BH reported having been told there had been a bomb on Burtons Farm for some days. Turned out to be a small cannon shell case. Glow over E London. Bomb explosion heard in direction of dump. Heavy firing – much nearer than usual. Received a report that a light is being shown on various occasions at Bibs Hall Cottages, Mr. Munden’s. Telephoned the Head Warden and on his instructions rang up Mr. Seebrook who said he would go and investigate at once. Notified Kimpton Head Warden of light at Mr. Munden’s Bibs Hall. Big flash bang in direction of Kimpton/Ayot St.Lawrence or beyond. Much firing all night. 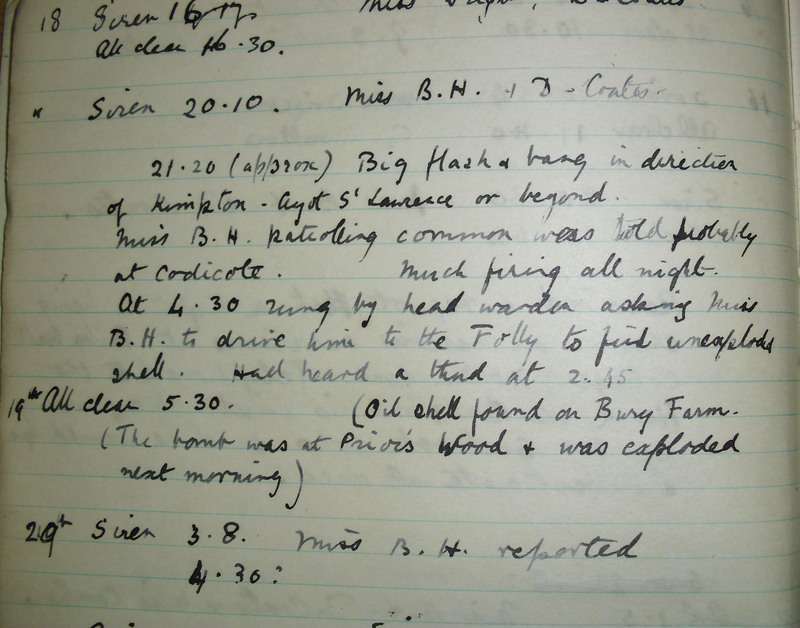 At 4.30 rung by Head Warden asking Miss BH to drive him to the Folly to find unexploded shell. Had heard a thud at 2.45. Oil shell found on Bury Farm. The bomb was at Prior’s Wood & was exploded next morning. Two bombs heard soon after 9 in a SW direction (Harpenden Luton way ?) Smell of burning reported but no sign of fire seen. Dull report in the distance. Miss BH came to post at 1.15 & reported that a HG had reported at his HG post that his windows had been shaken. Flares seen mainly to the South. Miss BH reported that torch signalling had been seen on the Common. Thought to be morse. I was rung up from Mr. Grant’s house (by Mrs. Carey) to say she had seen flashings from the windows last night & knew the exact time & that it came from among the bushes. Communicated at once with B.H’s house and reported to Senior Wardens house. 4 loud explosions at 20.41 in direction of Harpenden or Luton. At about 21.25 machine gunning heard. Tracer bullets seen. Much firing off bombs, particularly at midnight. Very heavy firing. Bombs Whitwell way. Three heavy explosions near Wheathampstead & incendiary bombs seen in same direction. Three heavy explosions between Wheathampsted & Harpenden. Heavy explosions all round. Much aeroplane activity, particularly between 3.15 – 3.45 towards Hatfield. Bombs dropped. G. Swallow resigned as messenger after absenting himself for over a fortnight. Aeroplane droning around frequently. Several bombs dropped to the SE between 4 & 5.30 particularly. Two bombs Sandridge (?) way & towards Harpenden. Many bombs. A loud one at 23.48 towards Ayot. A good deal of firing during the night. Saw about sand etc & stirrup pump notices. Sand delivered on [?] Common etc. Gunfire and planes about midnight. Heard bomb whistle by & saw incendiaries to the ESE (towards Brewhouse Hill. Reported that a plane had been seen to come down over Kimpton way. Report of an unexploded bomb near Water Tower about 50 yards east of the Slype. Mr. Mitchell notified. Went to see bomb crater. It is inside water tower enclosure. 23.50, 2 heavy thuds nearby. Rang up Glover who was out on patrol. 4 heavy explosions heard to S to SW (Hatfield & Brocket) Bright white light to the SE at 20.45. Gunfire & flashes seen in the S through the night. Planes heard & gunfire SSE. Soldiers clearing away bomb near water tower. Bomb disposal personnel have been digging for bomb by the water tower for 3 days. Saw Lt. Raylor who said they would not reach bomb before Monday; that all was safe. If he thought there might be an explosion that might endanger windows his men would warn the nearby cottages. Perhaps only a certain amount of concussion. Told by Mr. Mitchell to tell enquirers there is no danger as bomb is in deep. Saw bomb disposal lieut. Decision to be taken on Monday whether bomb is exploded or fuse removed. 26ft down. Lieut Raylor reported fuse removed from 55 kg bomb. Bomb removed in the afternoon. Received a call from Head Warden reporting having heard of a bright light over Gustard Wood. Had a look round but could see nothing. Message from Head Warden re looking out for specially for crop fires during next 24 hours. Reported to me that an incendiary bomb had been found in Paterson’s field & been taken to the farm camp on the Norbury’s field. Glover being out, I went to the camp. Only the cooks were there. Appeared ignorant of the bomb. Told the head cook to ask the head of the camp on his return to telephone to the Head Warden. Let Mr. Mitchell know. Exercise in conjunction with Home Guard to be arranged for October 12th. Warned all wardens & procured Dennis Duerdon & Miss L Rendell as messengers, Ross being ill. Telephone out of order late that evening. Telephone not working. Tried neighbouring ones. Miss BH having only available telephone went to ask Head Warden whether we should rely on messengers or use the ‘phone. We rely on messengers. She found 4 wounded prisoners who were not being treated and reported back to the post. Miss Wright went to render first aid (there were not first aiders here) to the case of haemorrhage & a messenger was sent with a message to ask the ambulance to fetch the 3 stretcher cases & to report to the Head Warden. On Dec 3 & 4 made a complete list of numbers in each house in the upper part of Sector. Miss Owen is doing Lower Common. Message received from Head Warden “Scorch” (?) & instructions to use rattle & bells if gas & whistle for incendiaries. Mrs. Mitchell informed us that enemy were using PO van no EL996. Received message that stinker (?) gas was being used. Received message that gas had been reported at Cross Farm. Was notified by Head Warden of three vans, Army, RAF & police . Wardens went to cross roads on common to watch. Message from Head Warden – heavy gun fire estimated to be Luton Hoo & Kinsbourne Green area. Military order. Any man whose papers show him to belong to 4/5 Field Survey section to be detained. Message from Head Warden – he had been advised by Chairman of Parish Council that all householders should draw a 24 hr supply of water. Enemy bren gun carrier seen leaving Herons and going towards Kimpton/Wheathampstead Road. Reported to HQ. Reported enemy soldiers seen going in to Herons farm yard. 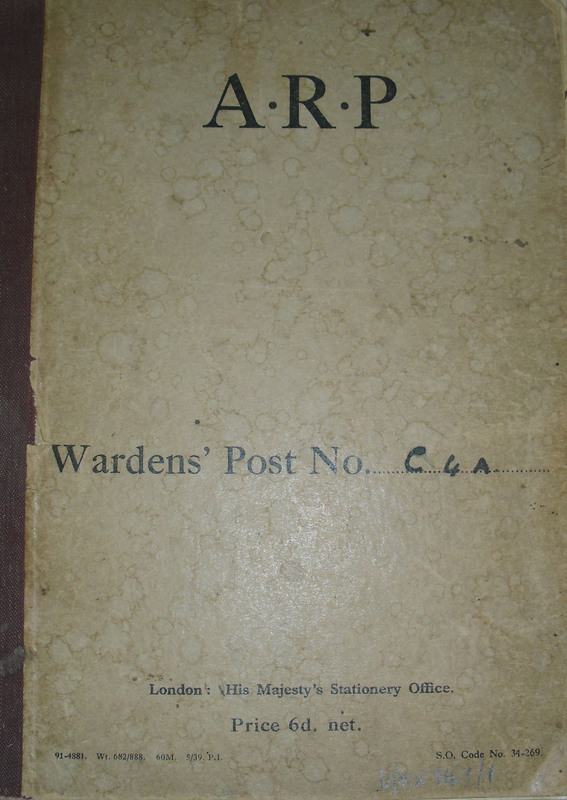 Head Warden said Lea Valley Wardens post had been captured; removed ARP notice from gate. Invasion exercise. INK BLOT OBSCURES …. 5 casualties. Bomb exploded. Stretcher fetched. Severe artery case brought in. Telephoned for ambulance. Ambulance out, car coming. Car arrived, 2 cases removed. Case 3 shock kept here. HE Bomb. Sent out 3 wardens. 2 casualties – 1 walking case, 1 stretcher brought to post. Car sent for. Rang up Head Warden as no car had come. Received message from Head Warden that HA had moved to W. 310G Car to come as soon as possible. 1 warden patrolled Lower Common; no incidents there. Message from HQ to notify wardens balloons might come down & are not to be touched. Bombs heard. Gunfire flashes to the south. Heavier gunfire than for a long time. Bomb fell not far off in Harpenden direction (Luton) at 12.00. Lights reported by Miss Wright near Little St. George’s where soldiers were camping. They were kept on even during the alert. Communicated with Head Warden & made enquiries at Garden House as to what steps we could take. Red signal light to the S.
Two loud explosions just before alert. Flares reported to the E.
Flares reported to the S.
Flares reported. Loud explosion. Many strips of black paper ¾ ins wide found on common & in garden. Some silver papered on one side. Handed over to Head Warden. Various windows broken by nearby explosion. Much flak over London area & heavy barrage. ‘Fly’ [flying bomb] passed by but not heard to explode. ‘Fly’ crashed not very far off, then another, Water End & near B[?] Farm. Reported bright lights showing intermittently to the South. Message received about 22.40 that lights were showing on the common. Rang up Miss Owen’s. Mr. Smith went to investigate & found bright light showing at RAF camps. He was told the light could not be blacked out, that the Air Ministry knew & that it had to be used at that hour & again at 6.00 am. Reported to the above effect to Head Warden at 23.10. Flash & explosion. Explosion reported by Miss Wright to be in the direction of Ayot or Codicote. Received instructions that no more night watches were to be kept, wardens only reporting if they have reason to believe that an incident has occurred in the sector or are specially summoned. Picked up very fine threads of silver which I saw floating down. Also broader flat strips about 12 inches long, silvery on one side. The filaments are about 10 inches long. All on Gustard Wood common. No sirens for V2 but explosions heard. Notice given out that warden’s service to be disbanded. Given a bunch of lovely flowers & attached card. Gave receipts for gas (?) helmets to Mrs. Kennedy & Mrs. Spershott. We all know how lucky Gustard Wood has been in its Head Warden & how very lucky the under wardens have been to serve under such a kindly Chief. 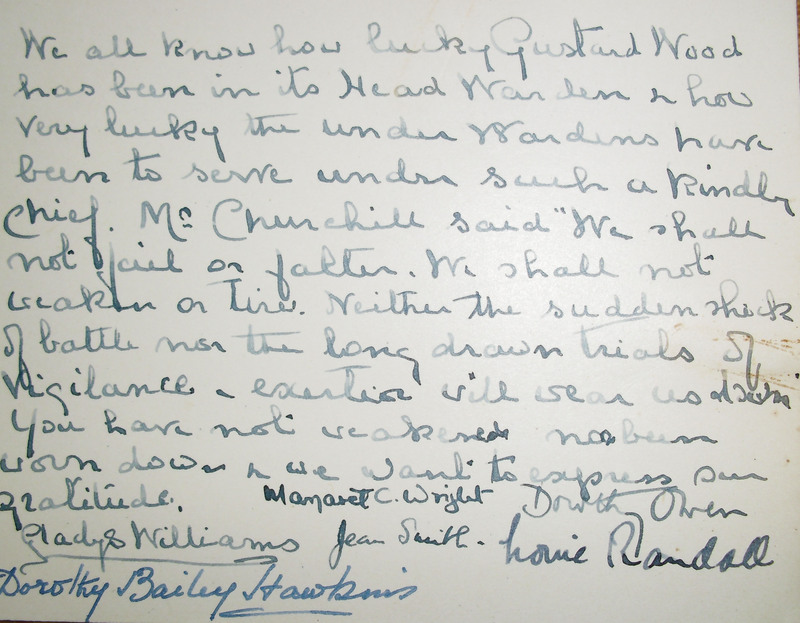 Mr. Churchill said “We shall not fail or falter. We shall not weaken or tire. Neither the sudden shock of battle nor the long drawn trials of vigilance & exertion will wear us down” You have not weakened nor been worn down & we want to express our gratitude. 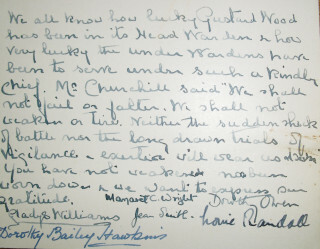 Signed by Gladys Williams, Dorothy Bailey Hawkins, Margaret C Wright, Jean Smith, Dorothy Owen and Louise (?) Randall.